In my opinion menu planning is one of the best things you can do to help ensure you will make healthy choices throughout the week. Sometimes I plan my menu out for the week for every single meal (like I did last week.) I do this for various different reasons, but last week it was because it was such a short week that I wanted to avoid going to the store by using what I had. Since I’ll be back for a couple of weeks without leaving, I don’t have to be quite as strict this week. Instead, I can just make sure I have options for every meal that I will be a happy camper with. I also have a list in my phone (I use the ziplist ap) with items I want to pick up for the week to make the meals come to life. 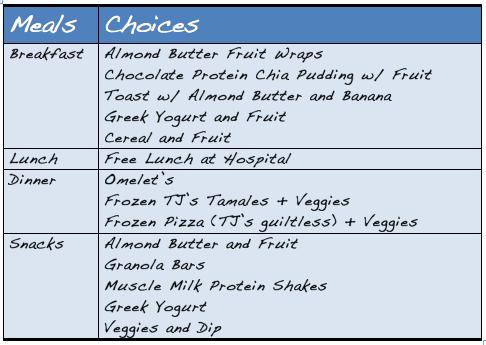 I will also definitely be printing out the hospital cafe menu monday morning (it doesn’t go up till then) and circling 2-3 healthy choices to eat everyday. Being prepared helps me stay on track and pick healthy foods I’ll be happy and satisfied with. You might have noticed that my meals and my recipes are very focused on quick and easy cooking for one person (easily modifiable for two people). They are usually healthy (see my thoughts on the 80/20 rule), relatively cheap, require little ingredients, and are often very simple and quick to prepare. I also eat a lot of the same foods (or foods with the same ingredients) many times throughout the week. This saves money and time, but can get boring. While I enjoy cooking complicated intricate meals, for the next couple months that isn’t really practical. So instead I’m trying to focus on eating simple foods with lots of flavor that I won’t get sick of. – At least 5 servings of fruits and vegetables per day. – 15-20 grams of protein per meal for muscle strengthening. – Use as much as possible that’s already at home. I’m still finishing out the end of Gina’s Summer Shape Up 2013, so workout #4 and some of the cardio plans can be found over at the fitnessista.com. Workout planning helps make exercising an unnegotiable part of my day. I try to make sure I focus on progressing my bodies ability by switching up my routines often. Specifically, I try to make sure I get full body strength training in at least 3 times a week. I use to only do cardio but I’ve fallen in love with strength training. I love increasing my abilities and getting stronger. I’d say it took about 6 weeks for me to even start to see results but once I did I was hooked! For tips on workout planning check out last weeks post. Whats on your workout/meal plan this week? How do you stay on track with your exercise plan? What are your strategies for workout/meal planning? Oh my goodness! Impressive article dude! Many thanks, However I am having issues with your RSS. I don’t know the reason why I am unable to join it. Is there anyone else having similar RSS issues? Anybody who knows the answer will you kindly respond? Thanks!! Hi Elane, I’m so sorry it took me a couple days to see this… apparently wordpress was putting all my comments into spam! I created a RSS feed so you should be able to subscribe using http://feeds.feedburner.com/HungryHobby Let me know if that works and I’m glad you liked the article!